Pressure mapping is not exactly new to the bedding industry. It has been used to test mattresses at least since 2012, when Scott Braddam used it to evaluate mattresses on Beds.org, for example in his review of the Select Comfort Sleep Number Classic Series. By 2013, Kingsdown was using it in matching a customer with the right mattress. Pressure mapping is the technology of charting where and how much pressure is applied when a person or object (the subject) lies, sits or stands on a surface. Pressure mapping is done by placing a grid of sensors between the subject and the surface. Points on the grid are sensors of pressure-sensitive material. This usually consists of piezoresistive (piezoelectric) crystals. This techonology is related to telephones and microphones. 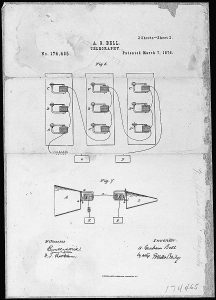 The mouthpieces of the first telephones had piezoelectic crystals under a diaphram. As the diaphram vibrated with the sound waves of the person speaking, it pressed on the crystals then released pressure. Under pressure, the crystals created electric currents which alternated in the pattern of the sound waves. These electric signals are transported over the wire to a speaker at the other end. In pressure mapping, as the subject presses on the suface, the grid shows a pattern of lesser or greater pressure on points of the grid. The signals from the sensors are read by a computer and shown on a screen. The colors and pattern show where the how much pressure is placed on each part of the subject. Different colors mean different pressure, with red as the most, blue as the least, and white as none. How Is Pressure Mapping Used for Mattresses? Pressure mapping is used in designing, testing, matching and marketing mattresses and pillows. From woven mats and cloth bags filled with various cushioning materals, mattresses have developed more complexity and sophistication. Innersprings were introduced, modified and improved, cushioned by quilting. Other means of support were developed with waterbeds and airbeds, ushering in the age of specialty sleep. Foams were added for more cushioning, eventually comprising both support and comfort in all-foam mattresses. To foam rubber (latex) and polyurethane foam, memory foam was added. Now microcoils are added to the mix. More thicknesses of foam were added to innerspring mattresses, creating hybrid mattresses. They were also added to airbeds and waterbeds. All this made planning and measuring the true comfort level of a mattress more complicated. A means was needed to accurately see how this affected a sleeper’s body. Hence, pressure mapping. Using pressure mapping results for test subjects, a mattress designer can see which materials and configurations work best for different people, according to gender, body type, weight, height, etc. Zoning is an important factor in many mattress designs. Since certain areas of the body need more support than others, they need things such as more or heavier coils, firmer foams, or extra layers. Pressure mapping helps mattress designers to configure the zones more efficiently, whether there are three, five or seven zones. New concepts in design also benefit from testing. These include Strobel‘s lever-support, Thomashilfen‘s Winged Slats, VitalWood‘s wood coils, and foam springs, among others. Pressure mapping also plays a role in refining the design of adjustable beds. Design of effective pressure relief becomes vital when it comes to healthcare products, for pressure sores are a serious health concern. Successful manufacturing and marketing depends on controlling the quality of the product. This requires both inspection and testing, both in process and of finished materials. Mattresses can be tested by roller machines for durability, but pressure mapping can test the actual comfort and support levels of the mattress. 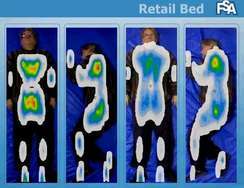 Pressure mapping plays a role in marketing mattresses. One example of this is Kingsdown‘s bedMATCH. 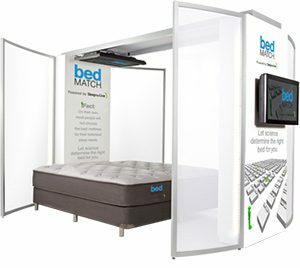 Kingsdown says, “Take the guesswork out of mattress shopping.” The bedMATCH booth at a retailer has a mattress equipped for pressure mapping. The customer fills out a profile, then lies down on the mattress for three minutes. Based on the reults of the pressure mapping and the profile, bedMATCH makes recommendations for a mattress. Of course, the recommended mattress is a Kingsdown model. More manufacturers and retail goups are using pressure mapping to find the best mattresses for their customers. It seems to give them an edge over stores without this technology. That edge would be real if the pressure mapping was independent of any one manufacturer. This could even be a benefit with mattress-in-a-box marketing. A store could provide pressure mapping for customers trying to choose among various online offerings. The caveat here is the same as for just lying on a bed in a showroom for ten minutes: It is not the same as sleeping on it night-after-night. But the readings may give you a better idea of what works best for you. Pressure mapping is one means that some smart beds use in monitoring the user’s sleep. The smart bed can then adjust the bed to relieve the pressure. This is coupled with data from other kinds of sensors to improve the whole sleeping experience. Pressure mapping is also used in designing shoes and foot supports. This actually began with non-electonic methods. The person stood on pressure-sensitive paper or film, and the results were used to design the arch supports. That’s how mine were done 27 years ago. Now electronic pressure mapping is used, and full-foot support inserts for the patient’s shoes are made. This technology is available through both podiatrists and chiropractors. Pressure mapping has a vital role in health care. This goes beyond the testing and selection of mattresses. Patients who are unable to shift their positions need someone to move them periodically to prevent constant pressure from causing pressure ulcers, more commonly known as bed sores. Companies such as XSENSOR Technology Corp., FSA, and Wellsense make and market sensor systems and monitors to detect when and how long pressure has been on the same joints and alert healthcare staff, family members or other caregivers when the patient needs to be moved. Some beds can move patients themselves or stimulate them to move. Pressure mapping is an example of how modern technology is changing the way we sleep. If it is designed and used right, this could mean more restful sleep for many of us. This entry was posted on Saturday, June 25th, 2016 at 8:40 PM and is filed under adjustable bed reviews, adjustable beds, airbeds, beds, buying a mattress, firmness, foam, health, materials, mattresses, padding, purchasing a mattress, smart beds, support, waterbeds . You can follow any responses to this entry through the RSS 2.0 feed. You can leave a response, or trackback from your own site.